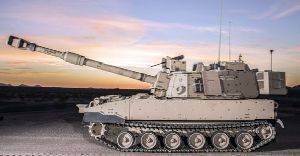 The U.S. Army has awarded BAE Systems a contract that clears the path to begin full-rate production of the company’s M109A7 Self-Propelled Howitzer and M992A3 ammunition carrier vehicles. The contract includes an initial $413.7 million award to execute the third and final option for low-rate initial production on the program. Options are also included that would begin the full-rate production phase, which, if exercised, would bring the cumulative value of the award to approximately $1.7 billion. BAE Systems will initially produce 48 vehicle sets, with the options calling for 60 sets per year for approximately three years of deliveries thereafter during full-rate production. The M109A7 consists of a new chassis design for improved performance, upgraded survivability, and components common to other Army vehicles, as well as additional key features. The M109A7 program is a significant upgrade over the vehicle’s predecessor, the M109A6 Paladin Self-Propelled Howitzer. It uses the existing main armament and cab structure of the M109A6, but replaces the vehicle’s chassis structure with a new design that increases survivability and allows for the integration of drive-train and suspension components common to the Bradley Infantry Fighting Vehicle. This commonality reduces overall program cost and logistical footprint, and provides improved mobility and system survivability to maintain dominance on the battlefield. The M109A7 also leverages technologies from previous design programs, such as a 600-volt on-board power generation, distribution, and management system, coupled with a high-voltage electric gun drive and projectile ramming systems. The state-of-the-art digital-backbone and power generation capability provides significant growth potential for future payloads, and will accommodate existing battlefield network requirements. The upgrades ensure commonality with the existing systems in the Army’s Armored Brigade Combat Team, including the BAE Systems-built Bradley Fighting Vehicle and the new Armored Multi-Purpose Vehicle family. Work on the M109A7 is currently underway at the Anniston Army Depot in Alabama, and at BAE Systems’ facilities in York, Pennsylvania; Elgin, Oklahoma; Aiken, South Carolina; Minneapolis, Minnesota; and Endicott, New York.